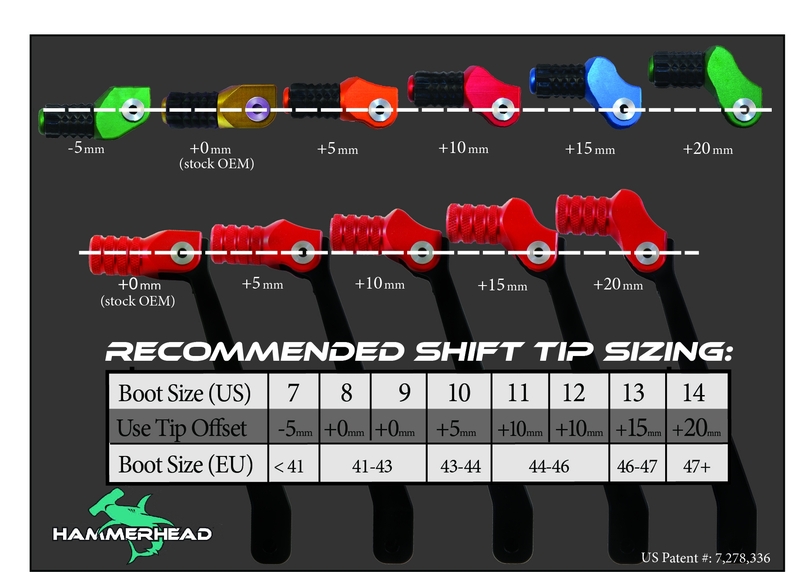 Size Chart | Hammerhead Designs, Inc. The shift levers on production bikes are designed to extend a certain length from the footpegs. This length is not just set randomly, it is crucial to proper engagement of the lever with the foot while staying properly balanced on the footpegs. The problem with this is that most manufacturers set their shift lever length to match the boot size of the average rider which is size 8-9. For riders who do not fit this mold, the footpeg/shifter compartment is either cramped or too long to reach. In order to get around this the rider must change stance to engage the shifter or adjust the height of the shifter, often putting themselves in an awkward, uncomfortable position that can affect their ability during aggressive riding. Hammerhead Shift Tips and Shift Lever Kits eliminate that problem!